Spinnerbait fishing doesn’t seem to as popular as it once was. Presentations like the Swim Jig, the Chatterbait and the Swimbait have pushed the good ol’ blade bait aside, but the Spinnerbait still has its time and place. Wind is usually the biggest tell whether a Spinnerbait will be effective or not, especially on clear sunny days. The wind does two things for us when it’s hollowing; first off, it stirs the water and moves all the plankton, which moves the bait fish. Often times its obvious where the bait will be pushed to, so you can count on the bass showing up to feed. If you are fishing multi-species waters, there is a good chance you’ll hook into other feeding critters as well. Northern Pike and Walleye are also susceptible to targeting bait that is being pushed up against the obvious windblown banks. The second reason wind kick starts the Spinnerbait bite, is because it makes it more difficult for the fish to track the fast moving bait. The chop on the surface created by the wind deflects light penetration every which way, and that means when your Spinnerbait rips by an unsuspecting Large or Smallmouth Bass, it will often react without thinking about it first. Spinnerbait size, color and blade selection are all important and ultimately are all determined by water clarity, depth, time of year and species you are targeting. The nice thing about the Spinnerbait, is it can be used in both dirty and clear water. In dirty water, bass will rely more on its lateral line rather than sight to track its pray. That’s why bright colors like a chartreuse and a #5 or #6 Colorado blade are important. The bright color assists with the sight factor and the larger Colorado blade will pump out a ton of vibration that is easily picked up by the lateral line. Since fish are in different depths throughout the season, you’ll want to select the right weight of Spinnerbait for the targeted depth. Weights like 1/4oz and 3/8oz are ideal to keep the Spinnerbait higher up in the water column. If the bass are cruising the shallows in the spring or fall, these weights will allow you to keep the Spinnerbait above the grass, and will even give you the ability to “yo yo” them back to the boat. Often times the “rolling” or “yo yo” retrieve will trigger bites on the fall. Alternatively to shallow water, Spinnerbaits can be a power house for deep water fishing as well. If you travel north, you’ll find many anglers in the spring fishing heavy 1 1/2oz Spinnerbaits in 20-30 feet of water and dragging bottom for smallmouth. This technique is an excellent way to target pre-spawn smallmouth in the spring. The heavier Spinnerbait gets down to the bottom and stays down there. Be sure to pair up that heavy Spinnerbait with a longer rod because you’ll need the casting distance to cover water effectively. Although you will find a magnitude of different Spinnerbait blades, the most popular are Willow Leaf and Colorado blades. Being longer and narrow, the Willow Leaf blade is generally used in clear water conditions and when you need to burn the Spinnerbait back to the boat. Tandem gold Willow Leaf blades are the first choice of Smallmouth anglers on clear lakes and reservoirs. Nothing compares to that gold flash in clear water on bright sunny days. If you are in need of some added thump, or need to draw attention to your Spinnerbait, the Colorado blade is definitely the right choice. The added width of the Colorado blade pushes a lot more water than the Willow Leaf, which in turns slows the retrieval speed down. That slower retrieval speed is also ideal for warmer water when the fish are lethargic. Increasing your Spinnerbait size to a 3/4oz and pairing it up with a big #5 Colorado blade is a great set up to “yo yo” for deeper suspended bass. The added weight will get the Spinnerbait down deeper, while the Colorado blade will flutter and reduce the fall rate. This can be a deadly technique for summer time largemouth. 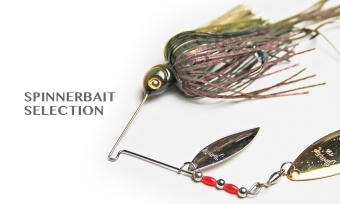 Times have changed and the Spinnerbait has a lot more competition. Although there are many newer and effective techniques available to us, nothing will ever duplicate that feeling of Spinnerbait bite!